If you are planning a vacation to Mexico’s Yucatan Peninsula, consider adding cenotes to your list of things to see and do. A cenote is a natural pit or sinkhole, an underground water formation made of limestone. They can be open or underground in caves. Mature cenotes are open and the younger versions have a dome intact. 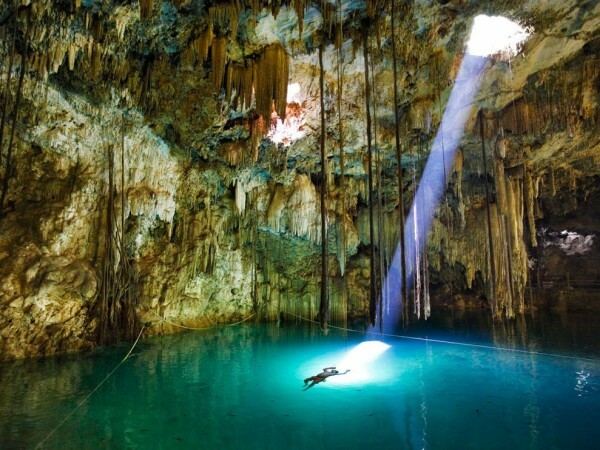 There are over 6,000 cenotes in Mexico’s Yucatan Peninsula but only 2,400 are registered. Stuffed with history and natural beauty, cenotes are a new obsession for travelers in Mexico’s Yucatan Peninsula. Mayans believed cenotes were sacred underworld portals and they used them to communicate with the gods. Villages were built around cenotes and the fresh water was believed to contain healing materials that led to eternal youth. Many tourists claim the mix of silica, quartz, algae and sulfur create properties in the water that detoxify, sooth and enrich damaged or dull skin. Cenotes are off the beaten path which means the experience is peaceful and quiet, lacking the long lines of the major tourist attractions. Only twenty minutes from Merida, the capital of Yucatan, you can find a hidden gem. A vacation destination that may put all others to shame. Cenote San Ignacio is a young cenote with a large dome over the top. A natural hole in the top of this cenote allows sunlight to filter in and it creates a magical atmosphere. The turquoise water is crystal clear and it has a maximum depth of nearly twenty-feet. Imagine snorkeling here at night! The Cenote San Ignacio offers a delicious restaurant that serves over thirty varieties of authentic Yucatan food. There are dressing rooms, showers, restrooms, lounge chairs, hammocks, pools, a playground, a sunny patio and a stable where you can view a unique, mud-proof species of Yucatan pig. Nearby you will find access to bike and cave tours. Let your imagination run wild as you make plans to visit Maya Cenote. The adventure begins as you transcend to the underground where you will find a hidden pool of freshwater. There are a few different ways to enter the water; by stairs, by rappelling, by zip-line or by swinging on a vine. This facility offers a restaurant and the opportunity to view local artisans creating Mayan handicrafts. There are gardens to explore and hammocks to relax in. Nearby is ancient Ek Balam where you can view recently uncovered Mayan ruins. Climb the great Acropolis pyramid and take photographs of the Riviera Maya. Located 14 miles south of Playa Del Carmen. You’ll be amazed as you explore an ancient Mayan city that is over 1500 years old! Due to some issues with recent property claims, some towns surrounding the cenotes are closed. Make sure the cenote you plan to visit is open before making plans. 2. Do not touch the formations. 3. Do not feed animals or fish. 4. Do not use commercial mask cleaners. 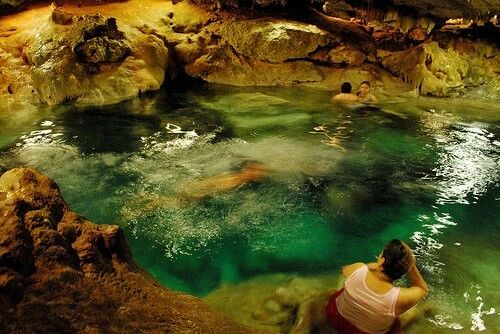 Exploring cenotes can be a fun venue for those traveling alone, in couples or with families. The cities near the cenotes provide a variety of foods and activities that allow tourists to get physical while learning about the ancient Mayan civilization. The views are magnificent and the promise of eternal youth is comforting too!